Lyndsay Johnson: A little helper, coming right up! A little helper, coming right up! 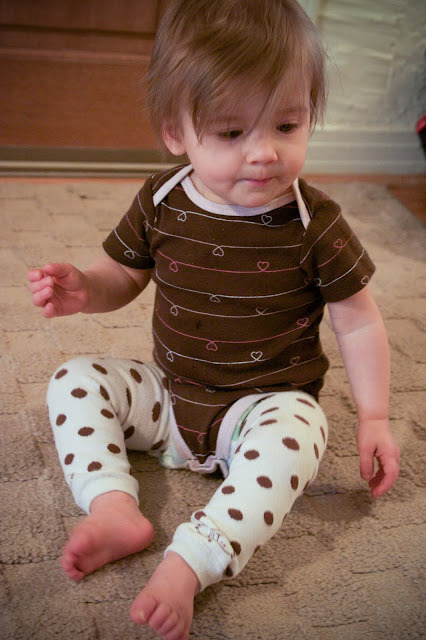 Me: "Finn, could you please grab me Maya's polka dot leggings out of her sock drawer? Her knees look scuffed up. No not that drawer, the one under. Not over, under. Yes! That one. Thank you!" Procures 2 purple and green polka dot socks. Me: "No, I need the leggings—the LONG ones, please. Brown polkadot ones. Close, though!" Finn: "Brown polkadots. Coming right up!" Me: "That's closer! They are longer, but they have stripes. Look for brown polkadots." Love the positive persistence in that story! Very cute leggings... I adore polka dots! Wylee says to me "is that avye?" I told him no and he said "why not?" haha! Love her hair! Her hair is getting so long now! 1. Finn = liquid awesome. 2. Those leggings = should belong to me. Well, my cherub. 3. Your new profile pic on the side bar is gorgeous. You stunner you! That is perfect. Good job Finn! I just happened upon your blog and am so glad I did. Your design is so COOL and your kids are adorable! Lyndsay, it's true. She IS the most beautiful little girl! Her hair is getting long! What a trooper Finn is! And I love baby legs- so cute! !